This site is a collection of prototype photos and some of my explorations over the years. My main focus is the D&RGW but you will also find a little bit of RGS and other lines mixed in. If you are interested in surviving NG equipment be sure to check out the surviving car lists below. If you enjoy exploring old grades then take a look at the maps section which features interactive aerial maps of various lines. If you like photos of the equipment in operation then head on down to the events section. If you are into models I'll tell you a little bit about my background and some of my projects. At an early age my grandfather got me interested in model railroading. He had relatives that were railroaders and he also enjoyed modeling SG equipment. As a kid I was interested in the Santa Fe since my grandfather's house was right along the line up to Wickenburg, AZ. I really didn't catch the NG bug until my college years. That happened after a trip to the canyon lands with a detour through Silverton. A few years later I made my first trip up to the C&TS and have been going back to NG land each year since then. My early NG models were all at the scale of 1:24 and operated on Gauge 1 track. I have built from scratch a C25, Chama coal tipple, Osier tank, Hermosa bridge and Cumbres depot. I have also started on a model of 463 but that has been on hold for quite some time. With the move to a new house I lost my outdoor railroad and have been working in HOn3. With all the BlackStone models that are coming out it is a great time to be in HOn3. With any luck my Chama & Cumbres layout will start to get more attention. You will also find that I am heavily into the latest technologies due to my engineering profession. Be sure to take a look at the wireless DCC project which is now controlling my HOn3 motive power. In addition to the models I love to go out and explore the old abandoned grades. I use whatever reference material I can find and scout out my trips ahead of time using the aerial photos that are readily available. This makes it quite easy to locate interesting targets to explore that can be plugged into the GPS to easily find things on the ground. I also use the tracks recorded by the GPS to enhance my interactive maps after an exploration trip. If you have any knowledge of D&RGW or RGS NG surviving equipment that is not on my lists please drop me a note. The lists have been greatly expanded by numerous individuals out there. I appreciate all of the input and photos that have been provided by others. Without this assistance the lists wouldn't be as complete as they are today. Now that we have that out of the way, take a few minutes to explore the site. Hopefully there is enough variety to provide something for just about any NG fan. 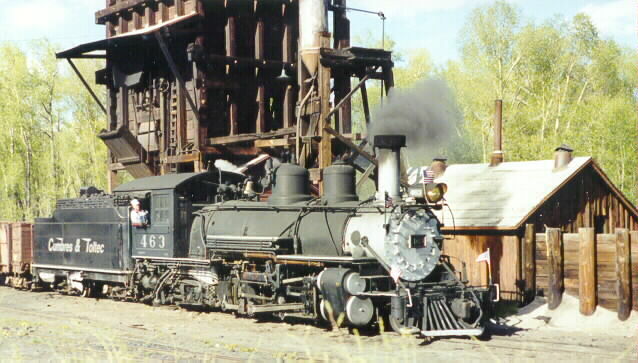 This is probably one of the best photos of the 463 that I have taken in Chama. I have snapped many pictures of K27 #463 before and after the restoration and was glad to see it go back into service after so many years. This has to be my favorite operating engine. 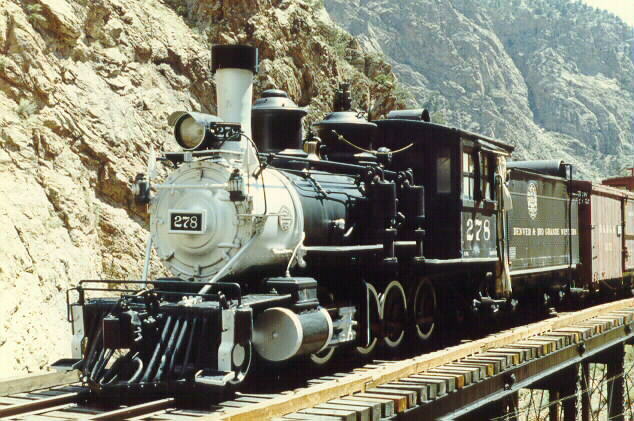 This picture was taken on the 27th of May 1995 as a passenger train pulled into Chama after a day out on the line. 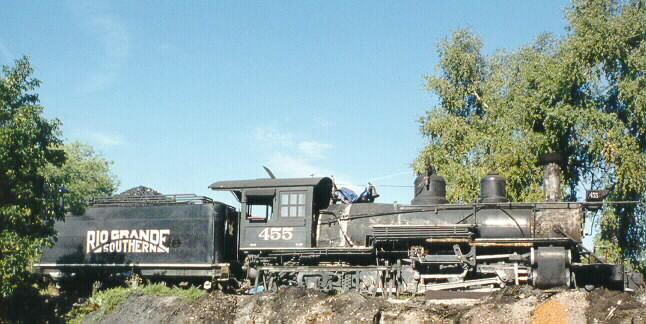 On a trip to Chama during September of 97 I found engine #463 in disguise. The engine had been lettered for an RGS special and was down for the season. I have never been able to get the lighting quite right when in Cimarron. It's just not a place that you plan to be for any length of time. This shot was taken in July of 91. I wish I could have seen this C16 running through the canyons but it was retired before I came along.